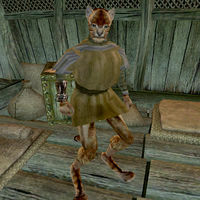 Kiseena is a Khajiit slave working in the Caldera Mine. She can be found in slave shack one. She is wearing a common shirt, pants, belt and the standard slave bracer. Like all Khajiit, she can see well in the dark and can demoralize others for short periods, but otherwise knows no spells. During a recent attempt at revolt by the slaves in the mine, Kiseena received burn wounds when one of the mages guarding the mine was trying to subdue her and accidentally triggered an explosion from flammable gases in the mine with a fire spell. The mine boss Stlennius Vibato thinks the fur on her burned skin may never grow back. On a note in the mine bunkhouse, her name is spelled "Keseena". This page was last modified on 30 May 2013, at 16:37.